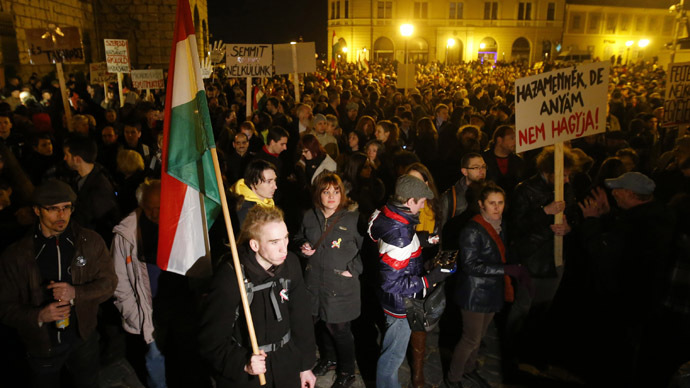 Thousands of Hungarians took to the streets on Sunday, protesting against draconian changes to the constitution approved by the parliament despite warnings from the European Union and the US. The below-zero temperatures and heavy snow weren’t enough to prevent 3,000 people from staging a rally in the center of the Eastern European country’s capital, Budapest. 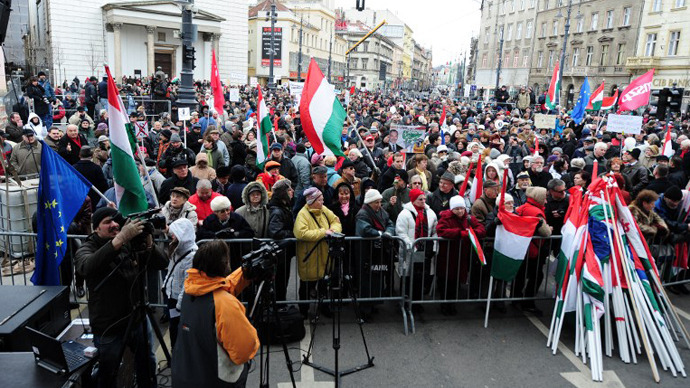 "On March 17, 2013 Hungary is not a dictatorship yet. But there is already an applicant for the job," Laszlo Majtenyi, former ombudsman and eminent Hungarian lawyer, is cited by AP as saying in his speech to the crowd. 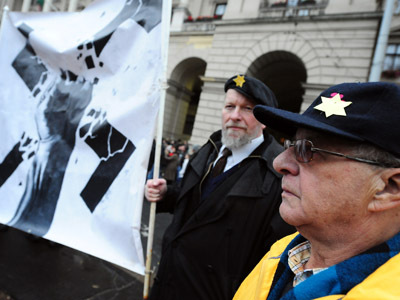 Sunday’s demonstration is yet another in the series of protest events, which were ignited by the amendments made by the parliament, which is dominated center-right Fidesz party of Prime Minister Viktor Orban, last Monday. On March 11, the Hungarian MPs voted to limit the powers of the constitutional court and increase the influence to the government. The move went on despite domestic and international criticism, with the EU, the US and human rights group labeled as an undermining of democracy. But Orban tuned down all power-grab arguments, saying that the changes to the constitution are in line with the European Union’s rules. "Who is able to present even one single point of evidence, facts, may I say, which could be the basis for any argument that what we are doing is against democracy?" as reported by Deutsche Welle. 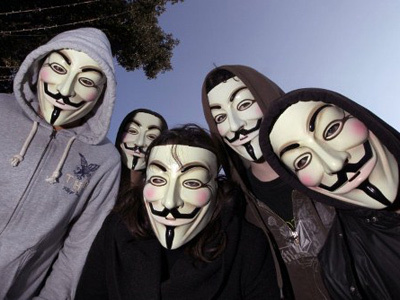 But the protesters seem to have enough “evidence” as they fear that the changes would open the doors to harsh government measures, which were previously struck down by the constitutional court, such as a ban on political campaign adverts in private media. According to the updated constitution, Hungary’s top court can now review the constitution or amendments to it only on procedural grounds, but not on substance, with all of the court’s rulings before 2012 ceasing to be in force. The changes have put Hungary at risk of losing its place among the 27 EU states as the president of the European Parliament, Martin Schulz, urged the European Commission to look into the matter. “We will see what the Commission presents [to us],” he said. “And if there are real breaches of European law, then one must consider an Article 7 process,” which allows the EU to suspend member states for breaching the its founding principles, including democracy and human rights.